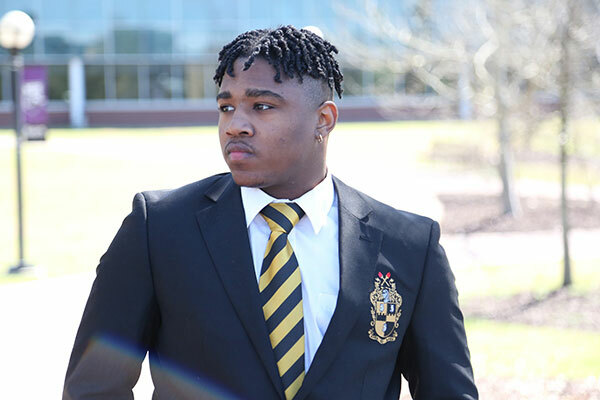 At MGA, Business major and student organization leader Markel Greene discovered academic talent he didn't know he had. High School: Luella High School, where he participated in varsity football, Distinguished Gentlemen mentoring organization, culinary arts, and Future Farmers of America (FFA). Family: Marthena Greene (Mother), Kevin Greene (Father), Marquez Skinner (Brother), Malik Skinner (Brother), Makala Greene (Twin Sister), and Trevone Sullivan (Friend). Employment: Resident Assistant and student worker for MGA's Recreation and Wellness department. Degree Objective: Bachelor of Science in Business with a major in Marketing. Career Goals: "I would like to eventually become a business consultant. I love the business world. There are so many different options in this field. I would like to work for a major company to learn more about how major corporations operate. After gaining enough knowledge, I would love to start my own business." He chose Middle Georgia State University because … "Its environment. The Cochran Campus is very down to earth and homey. I am able to have a good time through activities organized by Student Life and also manage to get my work done. I also chose Middle Georgia State University for its location. I knew that I would have opportunities in Cochran to give back to the community." The greatest thing he discovered about Middle Georgia State was … "The help available to students to help them succeed. The Writing Center, Math Academic Resource Center, and Student Success Center have all been a huge help to me." His greatest academic experience as a Middle Georgia State student has been … "Being able to sustain a good GPA throughout my years here. My grades weren't the best in high school but at MGA I made a huge turnaround. I've learned how to stay on top of my grades and manage my time well." To him, “greatness” means … "Being the best person you can be, striving for success, never giving up. People should always try to put their best foot forward and keep moving, no matter what life brings them." One thing people don’t know about him is … "I was in a drama club for two years. I love to act. Also, I took culinary arts classes for four years in high school. And, I have a twin sister." In five years … "My career will be well underway. I plan on going to graduate school and, sooner rather than later, start my own business."